So everyone knows what content marketing is. But do we know how to get the best results out of it? I know I’ve been doing this for over three years now and have hardly touched the potential of what is available. I’ve been to webinars, seminars and summits on the subject and continue to learn new ways to capitalize on content marketing. 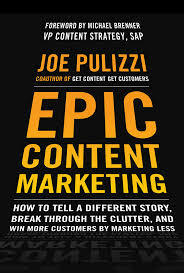 I recently read Joe Pulizzi’s book Epic Content Marketing. As usual, Joe does a great job explaining how to use and integrate into overall marketing plan. This is a good book for the beginner or for those already engaged to reinforce the right way of doing things. It’s easy to read, has lots of examples, from defining your strategy to developing and managing content to marketing your stories, and I’m sure you’ll get tons of useful tips on how to get more out of your content marketing.